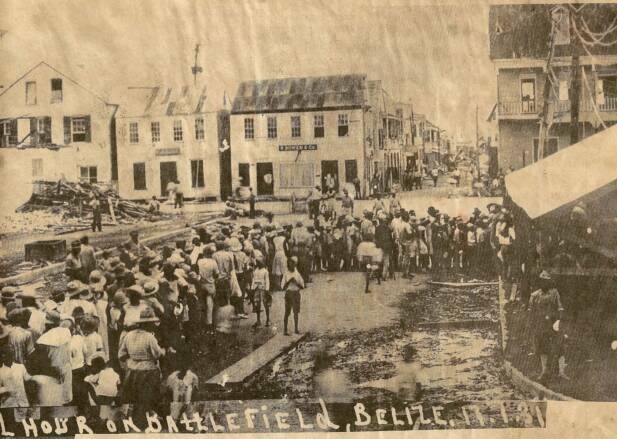 Sept. 10th, 1931, It was in the morning during the annual celebration of the Battle of St. George's Caye, parade that the Hurricane came ashore and destroyed Belize City. It was due to the belief amongst the City residents that the barrier reef would take the sting out of any approaching tidal wave, and it was the casualness which was responsible for the high death toll of almost 1000 of the the City's 15,000 population who died in the hurricane. THE HURRICANE OF 1931 WAS ONE OF THE FIRST IN MODERN TIMES AND THE WORST IN OUR HISTORY. DESTRUCTION AND MORE THAN TWO THOUSAND LIVES WERE LOST. 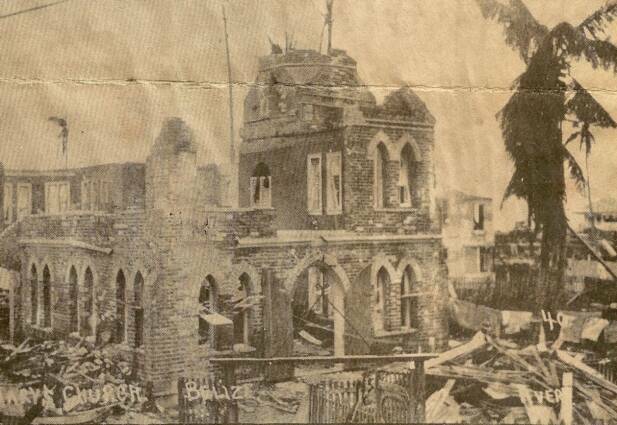 Mercy Convent, still in the same location then as now, was so badly mauled, it had to be rebuilt. 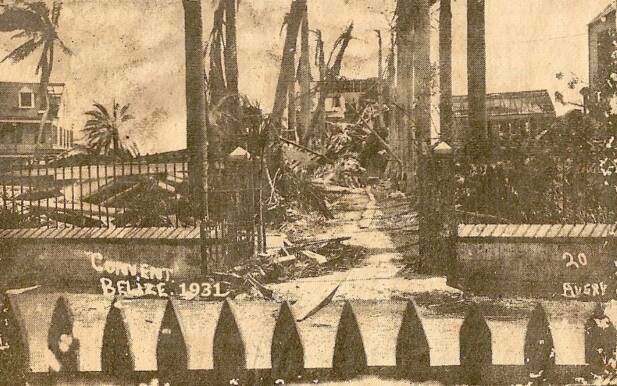 1931 Sept. 10th, St. Mary Church, destroyed in the Hurricane. 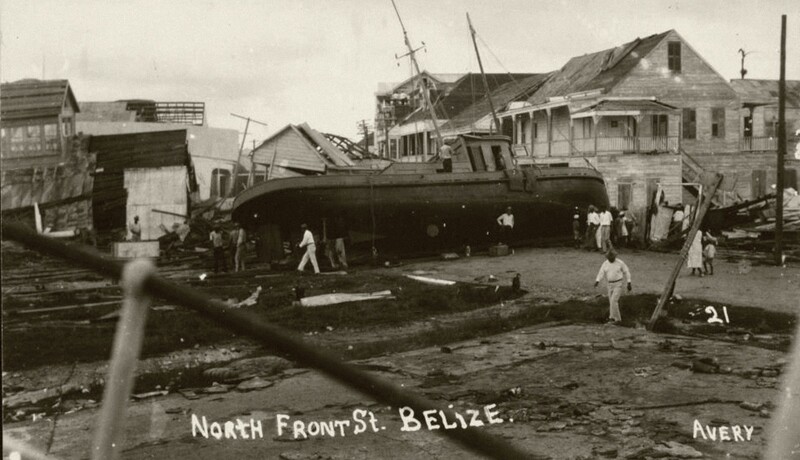 A view from Battlefield Park (downtown Belize) after the 1931 hurricane. 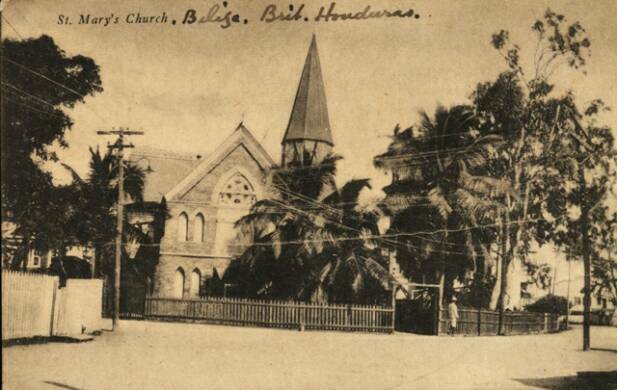 View of roofless Holy Redeemer Cathedral on the left on North Front Street showing Hyde's Lane intersection. 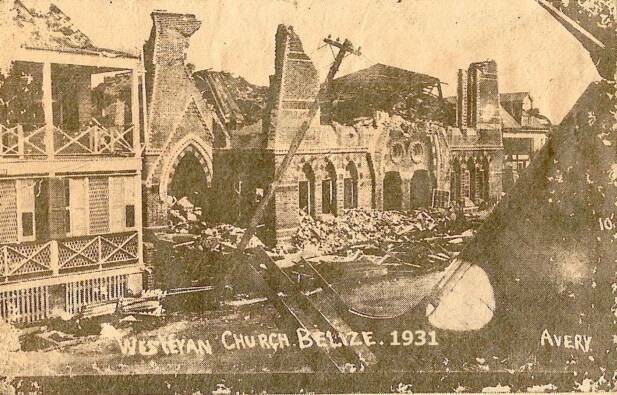 Wesleyan Church, on Albert Street, said to be the most beautiful building in Belize, did not survive. Many persons were trapped inside and were drowned by rising water. St. John Berchman College, in its Heyday. The finest in Central America, heading confidently to University Status. Mr. & Mrs. John Leslie, celebrated what was believed to be Belize's oldest wedding anniversary, in Nov. 1977. The couple were married at Wesleyan Church in 1907. 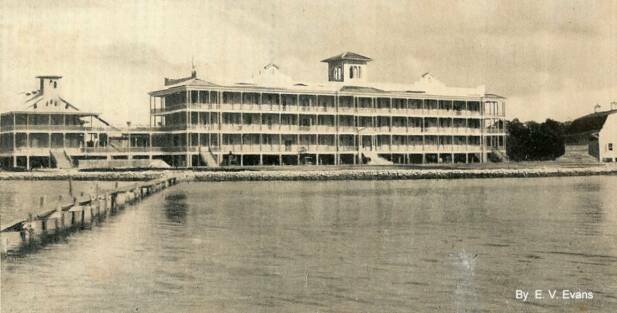 Mercy Convent, after the 1931 hurricane. 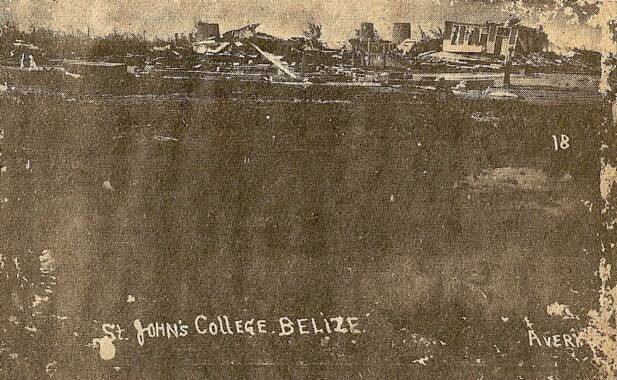 St. John's College, totally destroyed by the 1931 Hurricane which took the lives of many Priests and Scholastics. 1830 the first Wesleyan Chapel (wooden) erected. 1865 Wesleyan Chapel destroyed by fire. 1866 Dec. 23rd. New Wesleyan Church , Belize, opened for public worship. Sermon by Revd. Edward P. Webb. 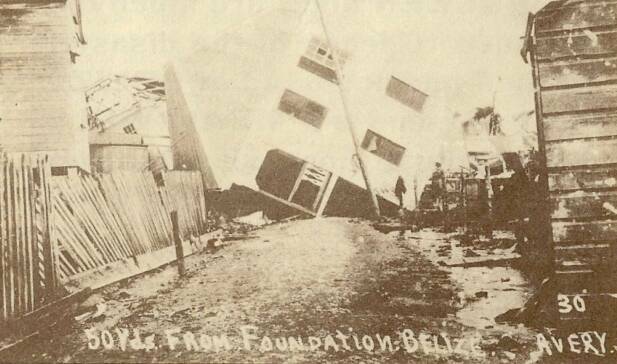 I was 11 years old, but I can still remember as if it were yesterday, when the hurricane hit Belize on the 10th of September, 1931. I attended St. Mary's School. Around August everybody was in glee, especially the children, happy that the 10th was coming, when we would all march through the streets with our red, white and blue flags, straw hats, white uniforms, and white tennis. I have to mention some of the teachers. I suppose some of them are still alive, but aged. I remember Miss Hilda Foreman, Miss Louise Longsworth, Miss Adela Bradley, and the headmaster, Mr. George Griffith. He was very strict and stern. Now let me tell you about the 1931 hurricane. People were waiting to see, and the rumour started in August that a hurricane would come to Belize. Most of the population had never witnessed one. The 9th night was a clear, starry night. In those days, the fireworks used to be up at the Fort, and people gathered at the Courthouse Wharf and along Foreshore to watch and enjoy the beautiful fireworks. 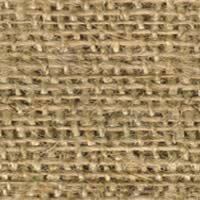 There was no sign of rain until about 6 o'clock the Tenth morning when a light, drizzling rain began. Even though it was raining, people were still getting ready to parade. The parade route was up Albert Street, turning around Government House down Regent, crossing over Swing Bridge, up Queen Street, turning up Barracks Road, right on to the Tamarind Tree, which is now Lindbergh Landing. All the children went to their various schools. The rains never came as one big shower. It would rain and stop, rain and stop. The bands were right there, al1 of us children ready to march, and then sadness and disappointment came. All the happiness turned to sadness when the headmaster, Mr. Griffith, got on the stage and said there would be no marching. Everyone was to go home (that was around 9:30am the morning), because a hurricane would be hitting Belize in a half an hour time. It did come. The storm, which lasted about an hour and a half, left some houses roofless and blew down some fences and trees. 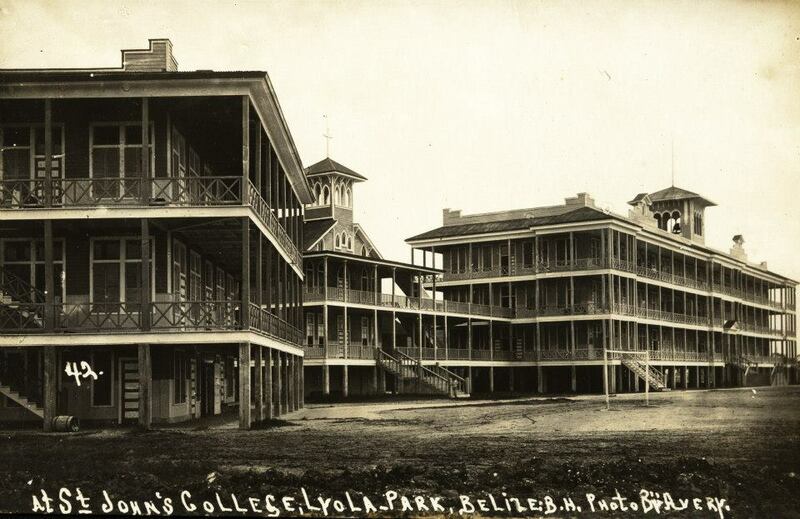 St. John's College was situated by the seaside up at Loyola Park over Yarborough Bridge. The building was a large, three storey, wooden structure, and went down in the first storm, as also did St. Andrew's Hall, which was situated corner of Prince and Albert Streets. After the storm passed, people came out to view the wreckage. Then something strange and unusual happened. The storm swung right back, but with more force, bringing a tidal wave about 10 feet high, which swept over the city of Belize, leaving 2,000 dead and thousands more homeless. 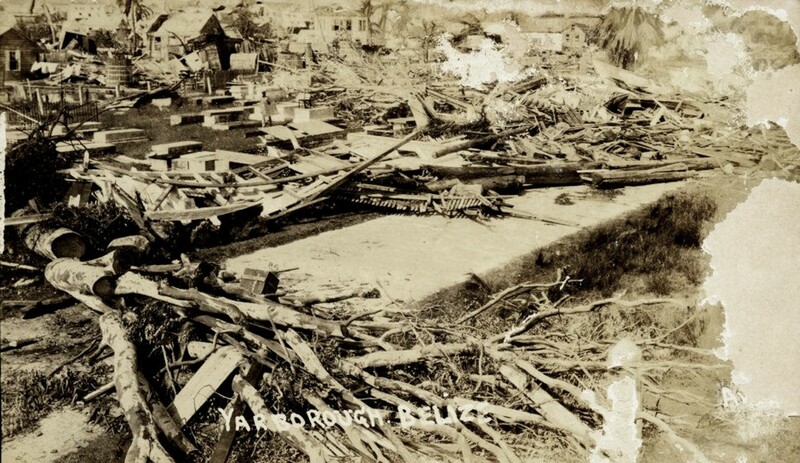 The most devastated area was the Yarborough area. If it was not for the water, many people would have survived. Most people who died were trapped under houses and died from drowning, including 11 Catholic priests. The 11th morning dawned with people looking for their children, some for their parents. All you could see was debris, dead people, houses on the street, everything in one. A lady that I knew, Mrs. Harmon, lost her husband and 5 children. Only she survived. How sad! I was living with my parents on West Street, but the storm caught us over the Pound Yard Bridge. We were trapped downstairs of a two storey house. It took us three hours from Pound Yard to West Street. We had to walk over houses, climb over trees, over boats, even dead people. Finally they started to dig mass graves to bury the dead, right in front of Pound Yard where the gas station is today. After that, people started to pick up the pieces and put them together by the grace of God, and the rest is history. 1787 Sept. 2nd Hurricane struck at 3 a.m., which desolated the Settlement, lives and considerable property, among which were valuable public documents, were lost. All the shipping went ashore and was lost. 1827 Aug. 20th Hurricane struck the Colony. 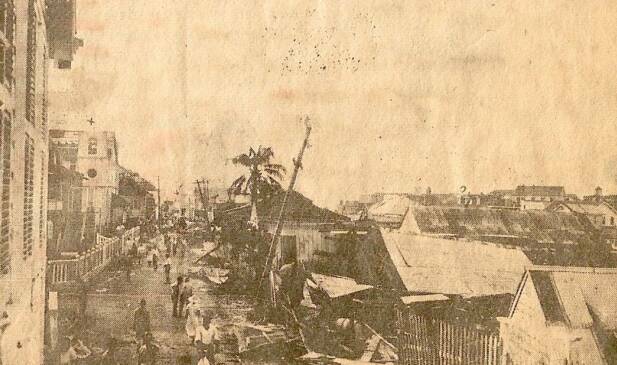 1864 Aug. 31st Cyclone struck the Colony. 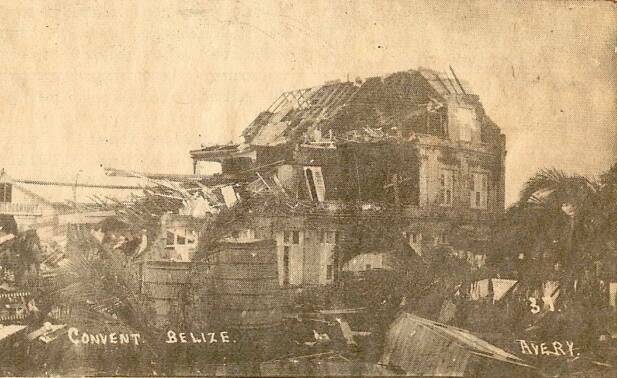 1915 Oct. 15th Damage done by Hurricane. 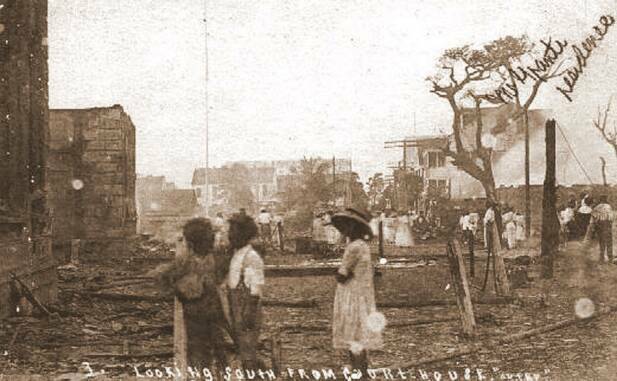 1920 Oct 16th Hurricane struck northern part of the Colony causing considerable damage. The sea at Corozal and Payo Obispo receded for several miles. 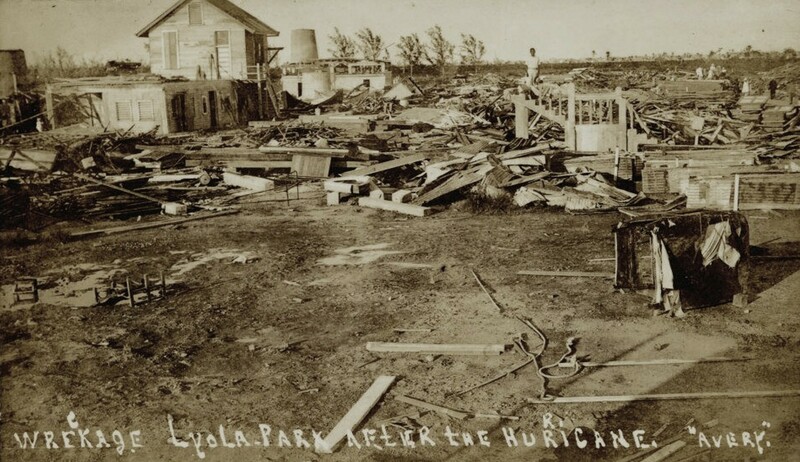 1931 Sept. 10th Hurricane struck, many lives and properties were lost. Foundation stone St Mary's Church laid. 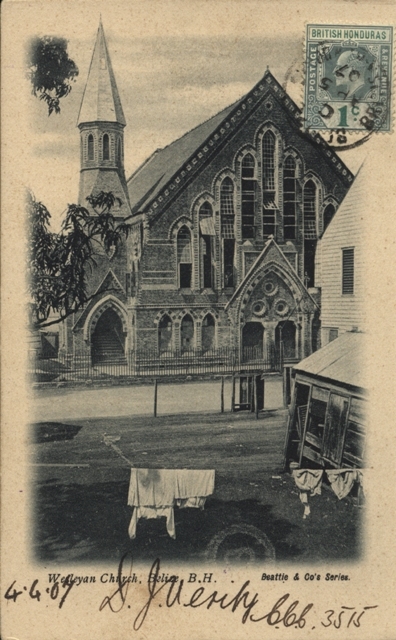 St. Mary's Church (New) consecrated by Bishop Donet of Jamaica. Roman Catholic Convent (St. Catherine's Academy), Belize, built.